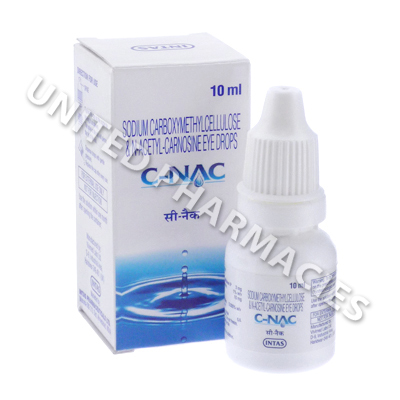 C-NAC (Sodium Carboxymethylcellulose/N-Acetyl-Carnosine) eye drops have recently gained popularity based on reported benefits in the treatment of senile cataracts. Other conditions which it may be useful at treating include disorders of the cornea, blurry vision, certain types of glaucoma, diseases of the retina, ocular inflammation, presbyopia, strained eyes, computer vision syndrome, dry eye syndrome and various other conditions. These eye drops contain NAC (N-Acetyl-Carnosine) which helps to deliver L-carnosine into an area of the eye called the aqueous humor. As a result of this, proteins in the structural lens are protected from oxidation. It can also help to increase the action of certain antioxidant enzymes in the lens of the eye. C-NAC (Sodium Carboxymethylcellulose/N-Acetyl-Carnosine) eye drops should be administered exactly as your doctor instructs you. Adult patients are sometimes directed by their doctor to apply 1 to 2 drops to the eyes, twice per day. However, patients who have been told to use this product as a preventative measure may be directed to apply 1 drop to the eye per day. Never use more than your doctor tells you to use. C-NAC (Sodium Carboxymethylcellulose/N-Acetyl-Carnosine) may cause some patients to experience side effects, however, serious side effects are rare. Seek medical attention immediately if any serious reactions occur. Do not allow the dropper to come into contact with any other surfaces, as this may cause contamination, which may lead to an eye infection. Contact lenses must be removed before applying these eye drops. You should ask your doctor whether or not it is safe to use contact lenses while undergoing treatment with these eye drops. Always use C-NAC (Sodium Carboxymethylcellulose/N-Acetyl-Carnosine) as you have been prescribed by your doctor. Never self-medicate or change your dosage without first consulting your doctor. The correct dosage can vary depending on your health, medical history, and the severity of the condition being treated.